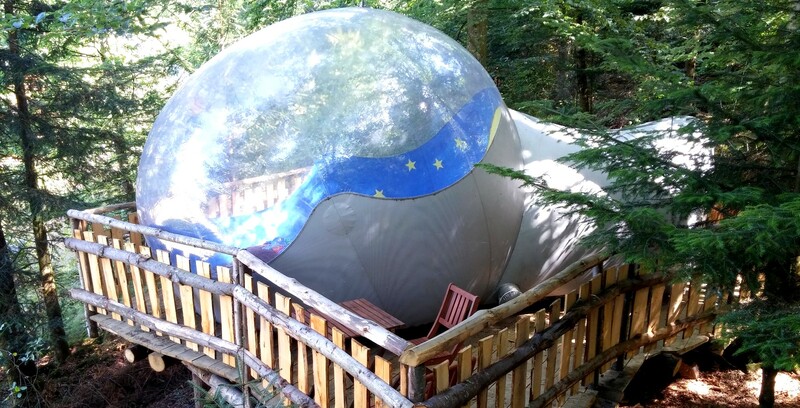 Sleep in a transparent bubble in the middle of nature ! Here is an innovative concept in accordance with ecological trends. Would you like to meet nature? Come and try this bubble tent which will give you the opportunity to sleep out in the open in a cocooning space. Close your eyes and imagine for a moment that you spend a night in a transparent bubble, set in the middle of vegetation. Imagine: you fall asleep in a comfortable bed with the starry vaulted ceiling and alarm clock bird and the first rays of the sun. The bubble is equipped with a blower system that allows to keep it permanently swollen and renew the air. As far as arrangement is concerned, the bubble has nothing to envy to the ‘classic’ guest rooms: comfortable double bed, bedside tables and lamps, soft carpet, all in a very zen atmosphere.